Throughout this sixth chapter of John, we hear a theme of hunger-- the hunger behind and beneath all other hungers... the hunger for a knowledge of God... the hunger for a word from the Lord. The day after the miraculous feeding of the 5,000, people come looking for Jesus, and he says, “Truly, I tell you, you are looking for me, not because you saw signs, but because you ate your fill of the loaves.” Jesus sees that the crowd is seeking him out because they got something they wanted—not because of the sign that was revealed to them of a deeper truth. Their stomachs have been filled, but they don’t understand the real significance of the miraculous feeding. Jesus wants to give them much more than they want. 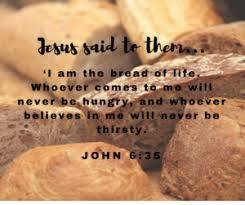 He points them toward a bread that lasts—that endures for eternal life…bread that is a gift from God. The crowd doesn’t get it, so they ask for a proof—something that would remove the risks of faith. If Jesus would continue to provide food, then maybe that would be proof enough. The crowd’s misunderstanding is understandable enough if they thought of Jesus as the prophet like Moses. There was a popular belief that God would provide manna again in the final days. This was connected with the hopes of a second Exodus. Many people thought that the messiah would come on Passover, and that manna would begin to fall again. The people in the crowd are stuck in their faith development. They have hopes, based on their traditions, and they want Jesus to give them what they want: manna from heaven, and a political leader to overthrow the Roman oppressors in a new Exodus. Jesus was trying to tell the crowd that what they wanted…what they expected and hoped for—wasn’t as good as what God wanted to give them. The people in the crowd longed for something. They knew they needed something, so they asked for what they thought they needed. They wanted something to make their life better—but they weren’t looking for anything that would challenge the way they understood the world. What God was offering was a new word, embodied in Jesus—a new Word which would transform their lives. In this chapter of John, and throughout the Gospel of John, if we listen closely we realize that Jesus and the crowd often use the same words—but with very different meanings. The crowd keeps misunderstanding what Jesus says, because they’re thinking in earthly terms, while Jesus is speaking in heavenly terms. Did you wonder when you heard this? How can they ask for a sign? Hadn’t they just shared in a miraculous feeding? Apparently, they don’t recognize the sign that has already been enacted before their eyes. How can they not get it? Because God’s thoughts are not our thoughts. God’s ways are not our ways. The logic of the world and the logic of the gospel are very different. The call to believe is nothing short of a call to conversion—conversion from the logic of the world--to the logic of God. The call to faith is a conversion from the logic of getting what you want to the logic of receiving what you need. As we grow in the Christian life, the logic of the gospel doesn’t overcome the logic of the world—but it puts it in its place, in its own proper sphere. That’s why the people had such a hard time understanding what Jesus was saying. Because God’s thoughts are not our thoughts. God’s ways are not our ways. The people in the crowd were trying to understand Jesus in terms of the culture of their day, in terms of the world’s logic… in terms of what was familiar and comfortable to them. It’s a very human way to respond. All too often we assume that the gospel is a little something we can add on to our present beliefs. The story of the encounter between Jesus and the crowd illustrates the tension between the familiar and the gospel. The text we read today is filled with that tension. I believe that behind and beneath all the other hungers, all the longings, all the futile ways we try to satisfy our hunger and restlessness—our most basic hunger is for a word from God. Earlier in his gospel, John quotes the prophet Isaiah in writing that the people “will be taught by God.” Friends, God has not stopped teaching. One of the essential beliefs of our Reformed tradition is the recognition of the human tendency to idolatry. As human beings, we tend to get comfortable with the values of the society, or the beliefs we have held in the past. When we hear a word from God that doesn’t fit in with the logic of the world, we have a hard time understanding the heavenly logic. The call to conversion in today’s scripture lesson challenges us to be open to God’s redeeming activity in the world through the presence and power of the Holy Spirit-- even when it doesn’t fit in with our earthly logic. The Spirit calls us to the new life revealed in Jesus Christ. That’s why we can’t settle in with the comfortable old ways of worshiping and living out our faith. As Presbyterians, we affirm that we are Reformed, and continually being reformed, according to the word of God and the call of the Spirit. Ours is a living, growing faith, which challenges us to a gradual, continuing conversion. The logic of the world teaches us that we will feel happy and satisfied if only we have enough money and material possessions… bigger, more comfortable homes…or more land. The logic of the world teaches us that we can make ourselves safe and secure by building walls…or through power or military might. Jesus calls us into a new life and starts messing with that worldly logic, saying we will be happy and blessed if we are meek and merciful…if we make peace… that we should love our enemies… and that we shouldn’t store up earthly treasures. We are called, as followers of Christ, to grow up in every way into him who is the head, into Christ. As the body of Christ, we are called to live in humility and gentleness, with patience, bearing with one another in love, making every effort to maintain the unity of the Spirit in the bond of peace. In Jesus Christ, God offers us an alternative story to shape our lives: the gospel story of how God loves the world…the gospel story of how Jesus came to embody God’s love by living among us, full of grace and truth, proclaiming the reign of God, preaching good news to the poor and release to the captives, teaching by word and deed and blessing the children, healing the sick and binding up the brokenhearted, eating with outcasts, forgiving sinners, and calling all to repent and believe the gospel. In a gift of amazing grace, Jesus gave his very life for us on the cross. God raised Jesus from the dead, overcoming the power of sin and evil, delivering us from death to eternal life. I believe that this gospel story is much more compelling and transforming than any stories the world gives us. I believe in the power of the gospel story to transform us and to work through us to transform the world. This is a story on which we can stake our lives. Together, we can rejoice in God’s amazing grace and power…which we celebrate in the joyful feast each time we come to the Lord’s Table. So, let us taste the bread of life. Let us taste and see that it is good! Amen!